Better known for its impressive artistic legacy, intricate canal system and narrow houses, Amsterdam is also home to a buzzing tech industry and several innovative companies. The capital of Netherlands has an extraordinary digital infrastructure and the Amsterdam Internet Exchange is one of the world's largest data transport hubs. Knowledgehut offers courses to IT professionals who want to be well-versed with the developments in the sector and get certifications like CSD certification in Amsterdam. Certified scrum developers (CSDs) are in much demand for their knowledge of Agile and Scrum principles. The CSD course in Amsterdam is divided into two parts. The initial part offers training for two days which includes knowledge of the Scrum framework, roles and ceremonies and how to work in the Scrum environment. While the second part comprises of the three-day CSD Technical Track training that offers theory and practical sessions on actual design and code samples. Students who enrol for the Certified Scrum Developer training in Amsterdam can leverage the Scrum Alliance approved course material and get access to the downloadable e-book. 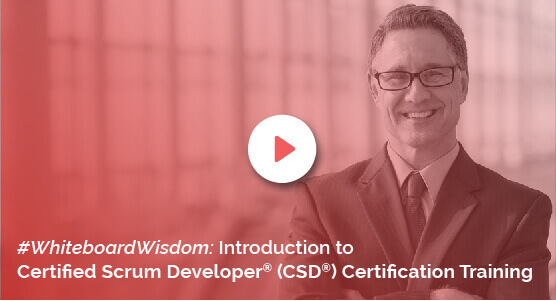 On getting certified as a Scrum Developer, professionals can practice just-in-time development and avoid overdesign and prevent any potential impediments to Scrum success. The comprehensive course in CSD training in Amsterdam helps professionals earn the Certified Scrum Developer credential that can give a comprehensive understanding of Scrum principles and Agile engineering skills. The Certified Scrum Developer certification in Amsterdam is critical for professionals trying to make a mark in the scrum domain and the best way is to get enrolled for the course at KnowledgeHut. It will enable the professionals to get access to well-curated courseware and experienced instructors.